So I thought this may generate some discussion. Q1) My chassis is fully trial fitted up and rolling, all the body work is mostly trial fitted and the seats have been test fitted. The dash was built including an ACEWELL cluster. The 1.8CVH engine is in and has been run, the gearbox and prop are also in place although the rear gearbox mount needs finishing. Rear lights are all done the mount for one front is 80% done. Q2) November 2014 I think. Stalled at doing the wiring, It's not that much of a job except when it comes to the dash which I think I counted 20+ wires to cram sort at the junction box. Since then Just been busy with other things and the garage has become an utter TIP!! Q1 chassis all welded, seats fitted (Trial) engine, box and diff in, column in rad in was playing with pedal set up. Q2) Did 3 hours Wednesday, 4 hours the week before, that was after a 3 month break #revitalised. 1. Fuel - tank fitting, copper, filter, rubber. 5. Wiring - test while complete, remove redundant circuits, retest, fix inevitable problems, tidy up. 6. Bodywork - Trail fit, lights, remove, paint, refit, then drop something on my nice fresh body work - swear. Oh and I've started gathering parts for my next build - a Midlana. Q1) 4 years and 1 month on the road, 11300 km on the odometer. Q3) I have 2 conflicting directions: making the car more roadable and swapping ST170 on bike throttles in. Re roadability, greasing the PU bushings had an immense effect on the cars' ability to soak up road imperfections, but it only held for about a year and a half or so. But removing and greasing all the wishbones and bushings is a chore, so it doesn't get done. The other things are ordering a bigger silencer, as the exhaust noise really makes the head buzz after an hour of driving or so. Also, sidescreens should help a lot with wind buffetting. I have the steel frames done and one of them even has hinges mounted! Re. ST170, I'm in the middle of lowering the sump since last spring or so, and I started mounting the GSXR750 throttles with 3d printed nylon adapters and trumpets this spring. Q4) Mostly laziness and other hobbies. Q1) I think about halfway. I've broken the back of the major components though and now its bodywork, electrical and mechanical refinements. Q2) Yesterday, sanding down some rear arches prior to polishing or more likely painting/wrapping. Q3) The nose, bonnet and scuttle/dash, electrics and getting it running with a Megasquirt ECU. Q4) A lack of money and time however I'm due to make my own scuttle and bonnet which will take some time to get perfect so will bridge the gap before more purchases can be made. 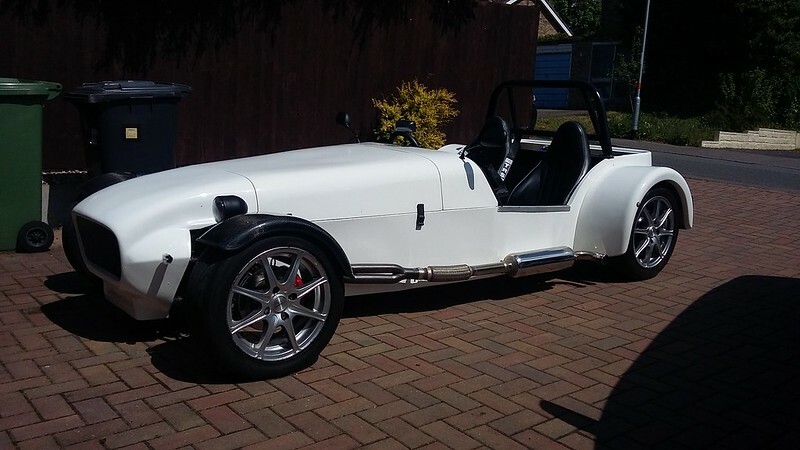 I've never liked the idea of a fibreglass bonnet, I'd want to see metal when lifting the bonnet plus I want Caterham style louvres! Q1 - Nearing the end of the build. Q2 - It's about 2 months since I worked on the roadster. Q3 - I have to wire up all my gauges and sort a headlamp issue and get my wheel alignment set up done and final engine tune up and brake balance tested. Mechanically almost finished. Will be starting bodywork once brakes are finished.